The New York Post reports that Leslie Ann Mandel, a wealthy Manhattan businesswoman who ran a fund-raising firm called the Rich List Company, died in June at the age of 69 and stipulated in her will that $100,000 of her more than $5 million estate be put into a trust fund for her 32 pet cockatiels, dog, and cat. (Never has a cat had more incentive to eat 32 birds.) She also went into great detail specifying the care the birds were to receive, including what and when they should be fed and how they should be housed (either in their aviary at her East Hampton home, or in some kind of custom cockatiel preserve). 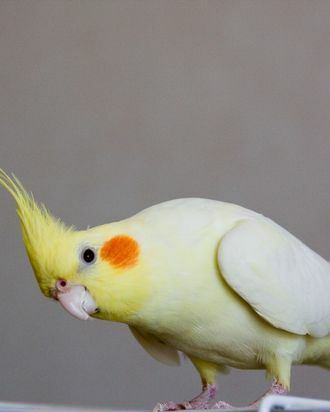 The 32 cockatiels are referred to by name in the will, lest any other cockatiels be considered for the inheritance: Alie, Angel, Avis, Baby, Blackie, Cody, Cubby, Dart, Dragon, Eva, Inky, Margie, Max, Nicki, Pigeon, Port, Pumpkin, Sammy, Sara, Shasha, Susie, Tanteleah, Tara, Tattoo, Tracy, Tundra, Ruthie, Victory, Wheetie, Zack 12, Zara, and, of course, Zippy.